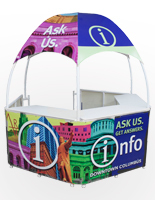 This portable display booth makes an excellent information counter at trade shows. Use it to provide directions and other information to attendees. 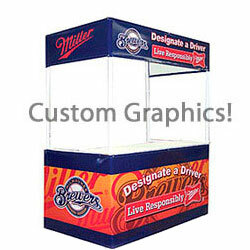 This portable display booth can also be used for ticket sales at sporting events. Eateries can sell foods and beverages using these tents. 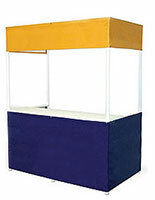 This portable display booth is great for school clubs looking for an exciting way of expressing themselves. No matter the situation, this art gazebo is capable of getting the message out! This portable display booth is 7'2" high including the 14"h valence sign at the top. The countertop is 38" from the ground, and the total width is 6'. This portable display booth is 95-pounds. 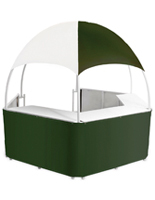 The lightweight design of the unit is perfect for traveling! 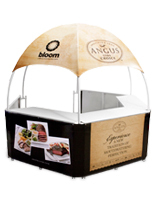 This portable display booth includes two bags for easy carrying. 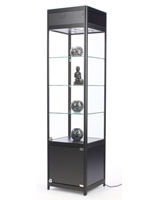 Users can keep the different components of the showcase well organized while on the go. 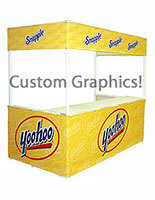 This portable display booth has one bag for the counter & graphics and another for the frame. The sizeable exhibit can be broken down and stored in a matter of moments. 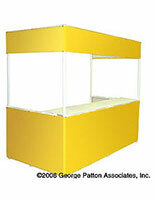 This portable display booth is simple and easy to set up. 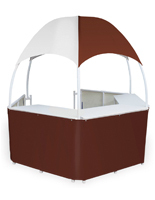 Users can have the gazebo set up in less than 10 minutes. 72.0" x 91.0" x 22.0"
70.5" x 38.0" x 19.0"